Whether by choice or necessity, people on gluten-free (GF) diets need to carefully watch what they eat, and finding wheat alternatives can be difficult. Here are some of the best places around for gluten-free dining. Head a few blocks south from State Street to Bassett Street Brunch Club (444 W Johnson St), featuring many vegan, kosher, and gluten-free options in a cozy diner. Plus, they serve Colectivo coffee! BSBC specializes in breakfast food (all-day) but also serve lunch and dinner options. Bloom Bake Shop (1851 Monroe St) is located directly across from Trader Joe’s, a short bus ride from campus. This is one of the only places in town to find a gluten-free waffle, in addition to flaky biscuits and donuts – both are gluten-free! Most gluten-free options directly on campus are Chinese food, including QQ Express (1401 University Ave), Ginger Root (in Union South), and Madison Cuisine (785 University Ave). 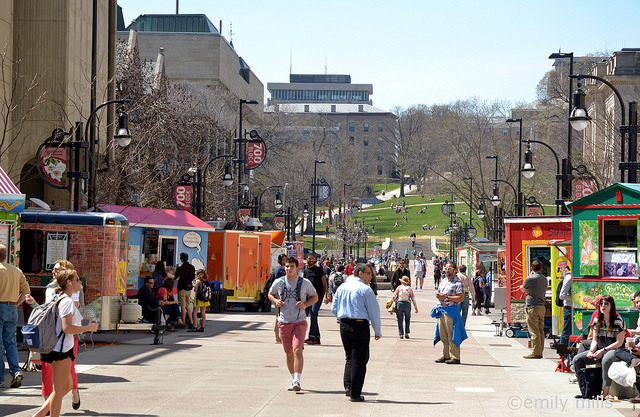 Many food trucks on Library Mall also offer gluten-free dishes, like Surco, a truck serving Peruvian fare. One particularly popular option is the rice-wrapper veggie spring roll at Fresh Cool Drinks. Mirch Masala (499 State St) has an all-you-can-eat Indian-style buffet from 11 a.m. -3 p.m. daily. Load up with tons of healthy dishes and basmati rice for one flat fee! Further up State, Himal Chuli (318 State St) deals in Nepali food, which is very similar to Indian. They have rotating daily specials of spice-cooked vegetables and rice for a cheap, healthy meal. Leave a comment and tell us your favorite GF place to eat!